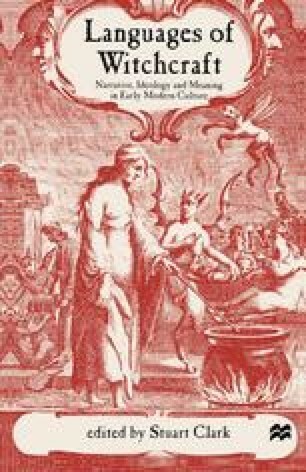 Following the publication of Stuart Clark’s groundbreaking study of demonology in 1997,1 it is probably no exaggeration to state that historians of witchcraft are better placed than ever before to understand how early modern Europeans conceived of witchcraft, and how it informed every aspect of their thought and culture. Largely concerned with the theoretical base of witchcraft, Clark has little, however, to say about the practical consequences of witchcraft belief, particularly the relationship between thought and action which culminated in the actual prosecution of men and women for the crime of witchcraft. In this chapter, I would like to suggest a number of ways in which it might be possible to utilize aspects of his research to generate a better understanding of one element of this process, namely the problematic nature of the uneven geographical and temporal pattern of witch trials. My initial interest in this subject was prompted by a desire to explore more fully the problem of the decline of élite belief in witchcraft in seventeenth-century England. It soon became apparent that the normal explanations for this phenomenon carried little conviction.